The trailer and title release for Avengers: Endgame was certainly enough to get Marvel fans around the world excited for the next installment in the Avengers franchise, but not everyone seems to be pleased with what they've seen so far. Simply due to the over-hyping of the movie and the negative backlash Avengers: Endgame has received, it is quite possible that the Infinity War follow-up could end up going down the same dark path as last year's The Last Jedi. As a quick recap for Star Wars: The Last Jedi, following the cliffhanger ending of The Force Awakens, Star Wars fans went rampant with theories on what they wanted to see in the next movie. 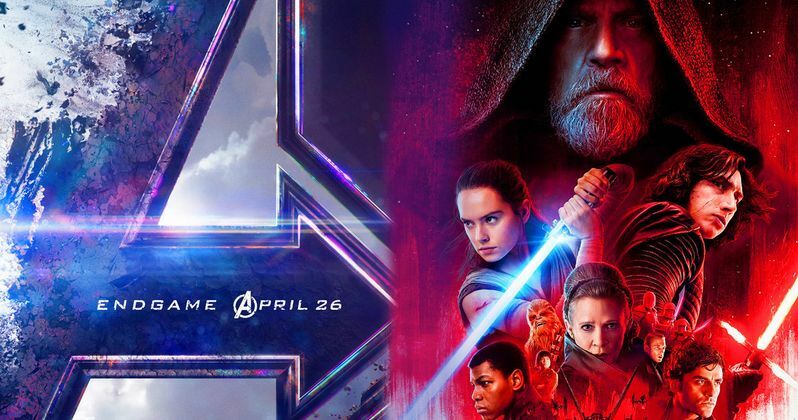 While the marketing of The Last Jedi was met with mostly positive attitudes, much like Avengers: Endgame so far, the release of The Last Jedi changed everything. Simply put, Star Wars: The Last Jedi was unable to satisfy the needs of everyone in the audience, as nearly every Star Wars fan wanted to see something different on screen, but were quite disappointed. The fact that The Last Jedi diverged from the typical Star Wars hero's journey certainly had something to do with the backlash as well, but regardless of the reason, The Last Jedi has seemed to permanently tarnish the Star Wars brand for fans, even though from a filmmaking perspective, the movie was rather brilliant. While it is too early to tell, it seems quite possible that Avengers: Endgame is heading down the same path. Since Avengers: Infinity War first released back in April, Marvel fans have also run rampant online with theories of how they think the "snap" will be undone, be it with time travel or by rescuing the souls of the fallen heroes from the Soul Stone. Many fans have also gone online to describe scenes that they "need" to see in the movie, from Steve Rogers seeing Peggy Carter in the afterlife, to Tony Stark facing the wrath of Aunt May. There are many characters that Marvel fans want to keep alive, in addition to characters they want to see sacrifice themselves in a noble way. Unfortunately, many of these character "needs" conflict with one another. While all of these theories are fun and actually sound like they can make a great movie, the fact of the matter is, there will only be one movie that we see on screen, and that will be whatever story Marvel Studios came up with years ago. Marvel is remaining incredibly secretive about what will actually happen in Avengers: Endgame, not even confirming or denying the time travel theories yet (which would presumably be a huge part of the movie if true). Chances are, like with The Last Jedi, many Marvel fans may end up being angry with Avengers: Endgame if their theories or needs are not met. For example, if Captain America is kept alive, there will be a number of fans rejoicing at his survival, but also a number of fans furious that they didn't get to see Cap make a grand sacrifice. Even though the movie is still several months away from its release, Avengers: Endgame has already faced some negative backlash in this regard with its title release. Since Marvel waited so long to announce the title for the movie, many Marvel fans have been theorizing what the movie will be called, with titles like "Avengers: Annihilation" and "Avengers: Reassembled" being some of the frontrunners. In fact, this backlash was even predicted by Kevin Feige, the President of Marvel Studios, back in April. This is what he had to say on the secretive Avengers 4 title at the time. If the past few years with big franchises has told us anything, it's that keeping details about a movie may help to keep out spoilers, but it can ultimately hurt the final project. The marketing for Star Wars: The Last Jedi revealed practically nothing about the movie except what characters we would see in it. When the movie released and Star Wars fans figured out that it was about Luke Skywalker being a grumpy old hermit and that it was all one super slow chase scene, they were upset because many of those fans had expected the movie to be the great comeback of Luke Skywalker. They were expecting an epic, not a "passing on the baton" story. Though the "baton" story was well told, it was evidently not what fans wanted. Right now, it appears as though Avengers: Endgame is going down the same path. We know the roster of heroes who will be in it, and that the Avengers will somehow try to reverse the decimation from the last movie, but that's about it. We don't know how they are going to do this, be it with time travel or by some other method. We don't know where they are going to do this, as they could spend the entire movie on Earth or they could travel across the galaxy to track Thanos down, making the movie essentially a space opera. We also don't know when it will all happen, as many fans are predicting the main plot of the movie will take place years after the events of Infinity War. While all of these factors do help to keep the movie secretive in order to make the first viewing more exciting, as history has shown, it does have its consequences. While Avengers: Endgame will still surely make a lot of money, as the cliffhanger ending of Avengers: Infinity War has already made it a box office draw. However, if the movie does end up being a disappointment to many fans like Star Wars: The Last Jedi, it could prove to be dire for future installments to the Marvel Cinematic Universe. https://www.youtube.com/watch?v=hA6hldpSTF8|Marvel Studios seemingly has plans to keep the MCU going for at least another decade, but this could end up being halted if Avengers: Endgame is met with the same backlash as The Last Jedi. Hopefully Avengers: Endgame will manage to live up to everyone's expectations, but based on what we've seen so far, there's a good chance it could inevitably disappoint many of its fans simply because, as Kevin Feige put it, all of the hype is getting out of hand.